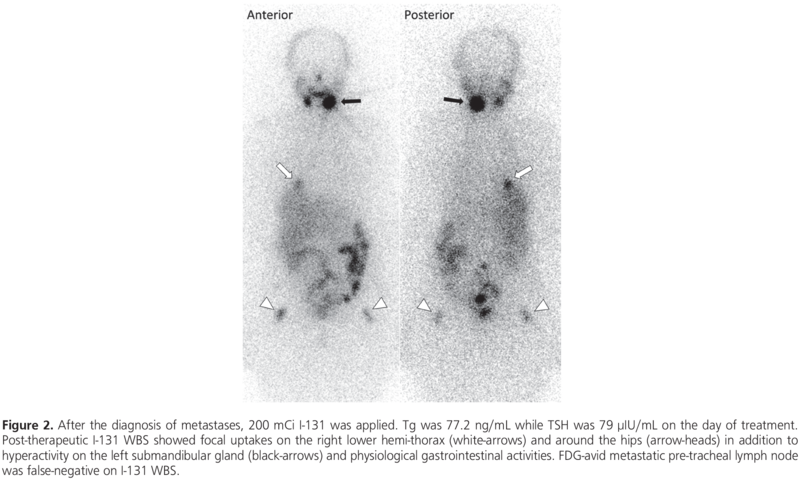 A hyper-metabolic pulmonary nodule was detected on 18F-FDG PET/CT in a 65-year-old woman who had been followed up for 12 years without any complaints following treatment for papillary thyroid cancer (PTC). Wedge resection was performed to the pulmonary nodule and the pathologic examination revealed PTC metastasis. On the post-therapeutic I-131 scan after radioiodine treatment, focal I-131 uptake was detected at the site of pulmonary wedge resection. At first, this finding was thought to be related to the residual lesion but diagnostic CT demonstrated only focal traction bronchiectasis at that region. In addition, a false-positive I-131 uptake was also detected at the soft tissue just lateral to the femoral heads probably due to inflammation. Medical Practices: B.Y., A.O., Ş.A., İ.T., A.A., Concept: B.Y., A.O., Ş.A., Design: B.Y., A.O., Ş.A., Data Collection or Processing: B.Y., Analysis or Interpretation: B.Y., A.O., İ.T., A.A., Literature Search: B.Y., Ş.A., Writing: B.Y. Jong I, Taubman K, Schlicht S. Bronchiectasis simulating pulmonary metastases on iodine 131 scintigraphy in well-differentiated thyroid carcinoma. Clin Nucl Med 2005;30:688-689. Gargya A, Chua E. Focal bronchiectasis causing abnormal pulmonary radioiodine uptake in a patient with well-differentiated papillary thyroid carcinoma. Case Rep Endocrinol 2012;2012:1-3. Jia C, Moadel R, Freeman LM. 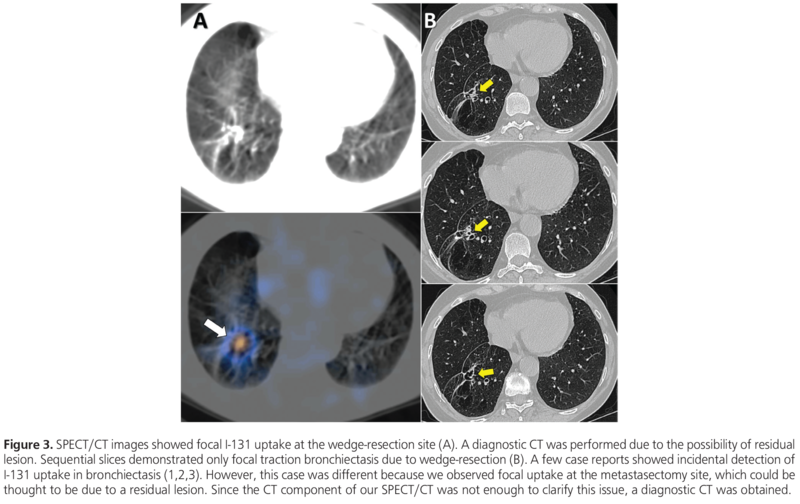 Focal thoracic uptake mimicking lung metastasis on 131I post-therapy whole-body scan in patients with thyroid carcinoma. Clin Nucl Med 2014;39:360-362. Oh JR, Ahn BC. False-positive uptake on radioiodine whole-body scintigraphy: physiologic and pathologic variants unrelated to thyroid cancer. Am J Nucl Med Mol Imaging 2012;2:362-385. Carlisle MR, Lu C, McDougall IR. The interpretation of 131I scans in the evaluation of thyroid cancer, with an emphasis on false positive findings. Nucl Med Commun 2003;24:715-735. Yazici B, Oral A, Eraslan C, Argin M, Ömür Ö. False-Positive 131I Uptake in a Benign Bone Lesion on Post-therapy Scan. Clin Nucl Med 2016;41:63-65. Çayır D, Araz M, Apaydın M, Cakal E. Inguinal Endometriosis Visualized on I-131 Whole Body Scan. Mol Imaging Radionucl Ther 2018;27:52-54. Garger YB, Winfeld M, Friedman K, Blum M. In thyroidectomized thyroid cancer patients, false-positive I-131 whole body scans are often caused by inflammation rather than thyroid cancer. J Investig Med High Impact Case Rep 2016;4:2324709616633715.